Learn everything you need to know about your 36 week old baby. 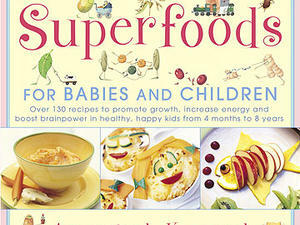 Track important developments and milestones such as talking, walking, growth, memory & more. Wait -- was that a word you heard? Around this time, your baby might make his first real attempt at saying a word, though it's not always clear what he's saying. For instance, you might notice that he uses the same sounds to indicate a familiar object, such as "bah" for bottle, or to communicate when he wants something, like "uh" for up (as in, "Pick me up, please!"). The difference between babbling and actual words is sometimes hard to detect, even for an attentive mom, but experts suggest that one way to tell them apart is intention. Is your baby just making sounds? Or is he talking about something in particular. Some children will use their own made-up versions of a word, such as "bankee" for "blanket," for years simply because it's easier to say. So don't hold your breath for a clear-as-a-bell, find-it-in-the-dictionary first word, which might not come out for a few more months -- or even well into toddlerhood. Instead, go ahead and chalk it up as a first word if you know exactly what your baby is talking about -- and so does your baby. In physical developments, your baby might be able to stand on his own with just a little support now. He might even have started cruising around furniture, practicing walking by holding onto the coffee table or an ottoman. Don't worry if he hasn't gotten there yet. That milestone could still be several weeks away, and that's normal. He is also probably sitting very well at this point, can easily get himself into a sitting position, and likes to play this way for long periods of time. Now's the time for your baby's 9-month checkup. This office visit might be more difficult than previous visits because your baby might be more fearful of strangers, including your pediatrician. Ease the terror by holding him for most of the visit, or by offering to nurse him or feed him a bottle just before the doctor enters, so he'll be in drowsy good spirits. The good news is your baby might not need any vaccines this go-round, or he might need just a couple at most, depending on which immunizations he received at 6 months. In addition to conducting the usual physical exam and asking about sleeping and eating patterns, the pediatrician will assess your baby's development with questions about how he moves, babbles, sees, hears, grabs, plays, and more. 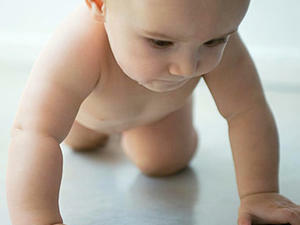 If your baby's cruising or crawling, your doctor might have you set baby on the floor so she can see him in action. If you're concerned at all about any aspect of your baby's development, be sure to speak up about it -- even if it seems like something minor. There's so much variability at this age (with some kids crawling, some cruising, and a few already walking) that it's easy to feel like your baby somehow isn't on track, even though he's likely just fine. Your doctor will be able to put these back-of-mind worries in perspective. Experts often say that it's impossible to spoil a newborn. 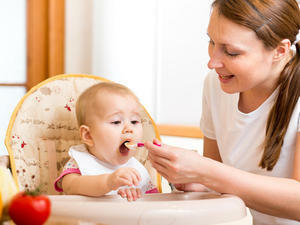 What they mean is that it's important to respond to your baby's physical and emotional needs. Carrying your little one? Terrific. Feeding him when he fusses? That's fine too. They aren't suggesting, however, that you should never set limits, particularly now that your baby is nearly 9 months old. If he starts trying to scale the bookcase, you've got to channel your inner Mean Mommy, give him a sharp "No," and remove him from the situation. You should also begin to think more about what limits you'll impose as your child gets older. Some are obvious. ("No playing with sharp knives," anyone?) Others are less so. Will it be OK for your child to jump on the bed? Eat Cheerios in the living room? Go down the slide by himself? Figuring out your household rules can be challenging and might require reading books, reflecting on your childhood, and discussing possibilities -- and compromises -- with your partner. Of course, some rules will have to be developed as you go along. (Who knew you needed a rule to prohibit inviting grasshoppers to the dinner table?) But having the basics in place will make parenting easier and will help you and your husband stay on the same page. Of course, the more rules you have, the more rules your baby will have to chafe against. After all, he wants carte blanche to explore, play with, and taste absolutely everything. But know that some rules and boundaries are good for older babies -- and as long as you're not no-no-no-ing him for every little thing, he's not going to feel stifled but protected and loved. Being Mean Mommy might be a good thing, after all. Reading to your baby will help develop her language skills. Choose books with bright colors and simple illustrations.